The Way of the Bodhisattva is the path for those who want to go beyond meditation and immerse themselves in a deep spiritual practice that transcends the ego and leads us to rediscover our unity with others and with the entire universe, in peace and harmony. It is a practice that stems from the aspiration to relieve the suffering of other beings before one’s own and, therefore, is the way of compassion and wisdom of Buddhas. The preparation for the Bodhisattva Way begins with an interview with the teacher, who will explain the steps required to begin. 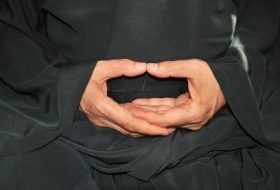 The preparation takes about one year, and along this year the person participates in the practice of Zen according to the guidance of the teacher. 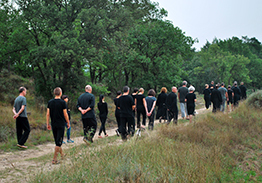 The prospective Bodhisattva must attend, during the academic year, the training program’s Dharma Workshops, in order to become educated in the theoretical and ethical basis of this practice. One of the tasks to be performed by the Bodhisattva, to show their determination, is to sew a small kesa made of patches of cloth, as a symbol of the transmission, which will be inscribed and delivered by the master during the ordination day. The Bodhisattva ordination ceremony is an initiation ceremony that takes place during the summer retreat, where the new Bodhisattvas take refuge in the Three Treasures -the Buddha, the Dharma and the Sangha-, and commit themselves to the Bodhisattva’s precepts. During the ceremony, the master gives a name to the newly ordained Bodhisattva and presents them with the small kesa along with a transmission lineage document. Harmonizing Zen mind with everyday life. Intensive practices. Retreats in the countryside and in the city. Workshops for perfecting meditative posture, attention to breathing and mental attitude. 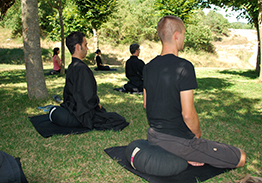 Mindfulness course based on the Zen tradition: 7 sessions during 2 months. 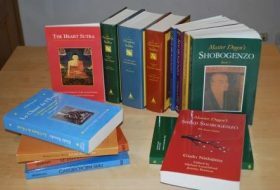 Zen courses and workshops. To understand the experience is to value practice.